3. LB Brian Urlacher, I don't think it happens. He is not a dominant LT, but he is very good, the coaching staff is familiar with him and he has held up in a pass heavy scheme. He can start day 1 and we can forget about the position that has been the bain of our team for years. He also comes 4-5 million cheaper than Clady. The Bears need a backup QB that is capable of winning 1.5 games a year and Moore has shown that he can do that in his time as a starter. He is fast and physical and has played a number of positions for the Saints. He can come in and compete at MLB while providing depth everywhere and being a special teams captain. 1 OG D.J Fluker [Alabama] 6'6" 335lbs. The Bears are putting a new emphasis on protection and they need to add talent to the OL, for the following reasons I think Fluker fits. -Aaron Kromer has always used huge physical OGs that can over power the line and do not give up interior pressure [Carl Nicks 6'5" 343lbs, Jahri Evans 6'4" 325lbs.]. -Jay Cutler gets more rattled from pressure up the middle and when the interior 3 players get bull rushed into the pocket. -D.J Fluker is a physical monster and while he does not have the feet to play LT he has the size, power and nastiness to step in at LG and physically over power people. Fluker is the closest thing to Mike Iupati I have seen and you simply cannot teach a guy to be a monster and an athlete. Good luck bull rushing Fluker. -Every year we see guys like Fluker get torn apart, [Orlando Franklin, Cordy Glenn, Kelechi Osemele, Carl Nicks] for being to big, too slow and all of these guys end up being quality starting OLmen in the league at different positions. 2 LB Kevin Minter [LSU] 6'2" 245lbs. The Bears need to start preparing for the next generation of LBs in Chicago and they have the luxury of drafting Minter and have him learn from the starters. Minter is fast, physical and has led a very good LSU defense for a couple of seasons. He reminds me of Lance Briggs because he simply does not miss tackles and he gets guys on the ground. Minter has the size to fit into any defense and he gives the Bears options moving forward with the defense. 3 TE Gavin Escobar [San Diego St] 6'6" 255lbs. The Bears need to get more dynamic at the TE position and replace the worst player on the team in Kellen Davis. Escobar is a solid athlete and he has good hands. He may not have the physical ability of the Gronk or Jimmy Graham, but he does have the type of hands that can make him a Todd Heap type of player. 4. 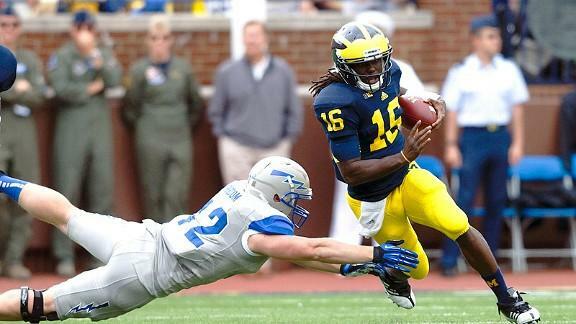 WR Denard Robinson [Michigan] 5'10" 195lbs. The Trestman offence features big WRs that can work across the field and smaller WRs that can stretch it vertically and to the sidelines to creates levels and gaps. Robinson has the speed and the play making ability that will stretch the field in both directions. It also gives the Bears a player with incredible upside as he is just developing as a WR and we could see serious growth. 5. C Dalton Freeman [Clemson] 6'5" 295lbs. You will notice a couple of things about Trestman OLmen, they are big in every position. He believes in protecting the QB and not allowing pressure. Freeman has the size to develop as a C of the future and can add to the massive, physical front line that the Bears are forming. 6. 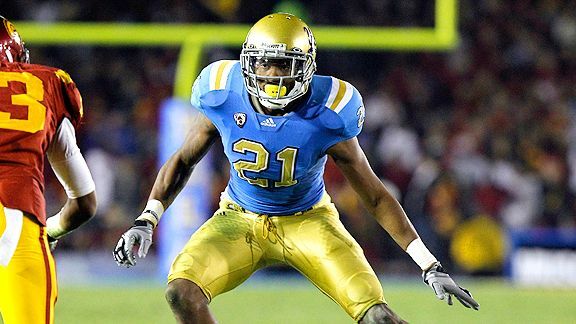 CB Aaron Hester [UCLA] 6'2" 200lbs. A big CB that can be developed behind Tillman and can add to special teams. I think the Bears should start taking flyers on late round defenders and hopefully over the next 2-3 years, while we start losing some of our defensive starters, we hit some home runs and find some starting calibre players. I want Bushrod but I don’t think I want him at $8.5 million a year…I don’t think his market will be that high…Moore & Casillas would be solid enough…not a fan of Fluker at all…love Minter but I can’t see him being available at #51…big fan of Escobar…would hate to spend a 4th on Robinson…he is an interesting gadget player but we have bigger depth needs than that right now at CB or OT…would even prefer to see a 2nd TE here…Freeman & Hester would be decent development picks. I'd rather spend a bit more and go after Jake Long. I love Fluker as a potential OG. Him never playing there could prevent me from spending a 1st on him though. Minter in the 2nd would be great but not sure he's there. I don't want Fluker at RT, although I think he can play the position just fine. But Fluker at OG is what we need. Despite some struggles in pass protection in the SEC he is an ELITE athlete can can bend and move in an incredible way for a 350lbs. man. Fluker is so big, so powerful and if you put him in a phone book people are not going to get by him or push him back. Fluker is no different than a guy like Kelechi Osemele who was very good as a rookie at RT and LG. In this draft class I would spend a 1st round pick on an OG. It is a position of increased importance around the league, look at recent drafts, and it is going to be of huge importance to the Bears because of our new coaches. I would be shocked if we don't see at least 1 elite level OG [FA or Draft] added to this team. I just don't want him at all...like I have said I like Chris Faulk far more and feel we could get him later in the draft to do the exact same thing...only with better athleticism and technique. Fluker would make a much much better OG then Faulk. What don't you like about Fluker as a potential OG? I'm not against spending a 1st on a OG. I would just prefer Warmack or Cooper since they've played there before. I think Fluker can do it. I'd just be nervous about it since it raises the potential for another 1st round bust. I don’t think he plays with good enough leverage to play inside against shorter opponents… he doesn’t play with good balance or bend…he isn’t quick enough with his hands in close quarters to get an effective punch on a quicker DT…I think as a prospect in general he is overrated…and I think Faulk would be far better at guard because I think Faulk…if of course completely healthy…is a better prospect who is better than Fluker in just about every area out with pure power. He reminds me of Lance Briggs because he simply does not miss tackles and he gets guys on the ground. Minter is a good LB, but don't compare him to Lance Briggs if you are gonna mention missed tackles. I've watched Briggs miss tackles for years now. That's very different then the guy I've seen. Pretty pricey for just an average LT. I would also prefer a TE with the second round pick. Nice write-up. The only move I see a real issue with is the 2nd round pick of Minter. I don't think there is much chance of him making it out of the first round, let alone to the end of the second.